If the mere mention of the blue-footed booby sends you into paroxysms, The Big Year is the film for you. 102 min. 20th Century Fox. Director: David Frankel. Cast: Owen Wilson, Jack Black, Steve Martin, Rashida Jones, Anjelica Huston, Brian Dennehy, Dianne Wiest, Rosamund Pike, JoBeth Williams, Kevin Pollack, Joel McHale, Anthony Anderson, Tim Blake Nelson, Steven Weber, Corbin Bernsen, Nate Torrence, John Cleese. With its near-total absence of humor, birding comedy The Big Year invites its audience to amuse itself with the names of avian species: hoary redpoll, arctic loon, pink-footed goose, and olive-backed pipit, to name but a few. If the mere mention of the blue-footed booby sends you into paroxysms, The Big Year is the film for you. Directed by David Frankel (The Devil Wears Prada) and scripted by frequent Bill Murray collaborator Howard Franklin (Quick Change) from Mark Obmascik's non-fiction bestseller, The Big Year proceeds from a promising premise that focuses on three birders with something to prove to themselves by doing a big year. Wilson’s reigning champion Kenny Bostick fears losing his title, so he sets out into the birding community to keep his eye on his prize. Martin’s “rich executive” Stu Preissler wants to pursue the dream he’s been putting off while running a corporate empire. As for Black’s Brad Harris, he could stand to be a success at anything at long last, so it may as well involve his love of birding. The Big Year does several things right, saving it from being a dismal washout. For starters, Franklin educates the audience about birding phenomena, like the boon of a “spring fallout” that brings a rush of rare species where enthusiasts can find them. 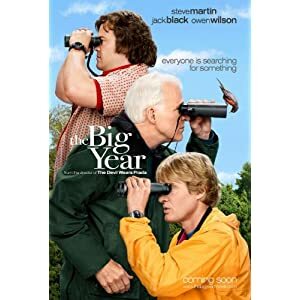 The Big Year also understands the obsessive personality, which can turn a hobby into a homewrecker; Wilson’s character has lost at least one wife to birding, and he appears ready to repeat history with current wife Jessica (Rosamund Pike). And then there’s the exploration of unlikely friendships—between, say, corporate “winner” Stu and ostensible “loser” Brad—built on like-minded personalities. So The Big Year has heart, and that’s something. Perhaps that soft spot also keeps The Big Year conventional, the lack of cynicism precluding wicked humor, but there’s a place for this kind of kinder, gentler comedy. The message of choosing the right priorities proves more palatable in this film’s hobbyist context than it has been for years (the world doesn’t need another lousy family comedy about a workaholic dad learning to come home to his family). That said, who wants to see Steve Martin, Jack Black, and Owen Wilson take turns whiffing every time they get up to bat? When Martin starts boogie-ing like a “wild and crazy guy,” it’s a colossal relief for ten seconds, but also a sure sign of the film’s total comic desperation. The Big Year alights on Blu-ray in a Blu-ray + DVD + Digital Copy Special Edition from Fox. Image and sound quality is pretty average, not unlike the film. No digital artifacting disturbs the image, which retains its film grain, and color also remains true to original form. It's probably more to do with the source material's cinematographic sources than anything else, but the picture looks a bit dull somehow, and sharp detail isn't a given in every scene, some of which go a bit soft. Still, there's no question you're looking at a hi-def transfer that's a darn sight better than its standard-def equivalent. Audio doesn't get quite so obvious a boost, though dialogue is never less than clear, the score sounds robust enough, and ambience contributes to the nature scenes, in particular. Given the limited demands of this amiable comedy, the Blu-ray presentation never lets it down. The extras offer a sampling of typical bonus materials, distinguished mostly by a value-adding behind-the-scenes doc. The making-of featurette "The Big Migration" (18:28, HD) trails the uncommon road-trip production and includes cast and crew comments, including a sit-down with Martin, Black and Wilson interviewed together. Also here are twelve "Deleted Scenes" (17:37, HD), a "Gag Reel" (5:58, HD), and the "Theatrical Trailer" (1:47, HD). All site content © 2000-2019 Peter Canavese. Page generated at 04/25/2019 09:10:58PM.